Clth, 8.75 x 12.25 in. / 264 pgs / 203 color / 65 bw. Text by Tracy Bartley, Inka Bertz, Edward Chaney, Roman Martin Deppner, Michal Friedlander, Eckhart Gillen, Cilly Kugelmann, David N. Myers. Cleveland, Ohio-born painter R.B. Kitaj (1932–2007) lived and worked in London, England from 1959 to 1997, where he pioneered a new type of figurative art in the 60s with his artist friends Frank Auerbach, Francis Bacon, Lucian Freud and Leon Kossoff, all of whom would find themselves dubbed the “London School.” Kitaj’s art mixed modernist allusions to literature, art history and Jewish history with a tremendous feeling for figuration and color that owed much to the elegant contours and palette of Degas. In the mid-70s, Kitaj positioned himself as a Jewish artist, authoring a Diasporist Manifesto and attempting to instigate a modern Jewish school of painting. 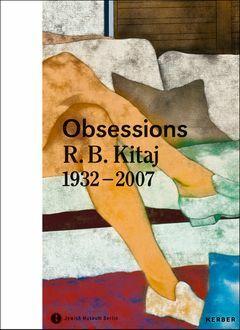 This catalogue is the first new Kitaj overview since the artist’s death in 2007, and looks at all the major periods of Kitaj’s work, surveying prints and sketches as well as paintings. FORMAT: Clth, 8.75 x 12.25 in. / 264 pgs / 203 color / 65 b&w.